SSL certificates encrypt sensitive data so no other people can read it. Keep your website data stored securely with an SSL certificate. Using https:// on your checkout pages helps increase conversion rates. Having an SSL Certificate on your domain helps improve the security of your website by encrypting all of the incoming and outgoing information, and is essential if you’re going to be processing payments directly on your website. Back in August 2014, Google announced that they would now be using HTTPS as a ranking signal, and pages which have HTTPS enabled will benefit from a minor boost in rankings. To get the full benefit, you should enable site-wide HTTPS. Secure Socket Layer (SSL) is known as a way of protecting the data that is being transmitted through your website, as to give you and your customers a layer of security and protection. SSL usually means that whatever the user does on the website, stays within his own judgement and no 3rd party can interfer. Here are a suggestions that we recommend, and know others would too. RapidSSL’ s new web console features help make the task of managing your SSL/TLS certificates much easier. RapidSSL issues most SSL certificates witin minutes of enrollment, helping you develop and launch a secure site quickly. Our root certificate has 99+% browser recognition. With a RapidSSL certificate, you get a quick and efficient online validation process. That means no paperwork and less hassle for you. The warranty is the amount paid out to your customer, should he or she incur a loss due to a wrongly issued certificate. 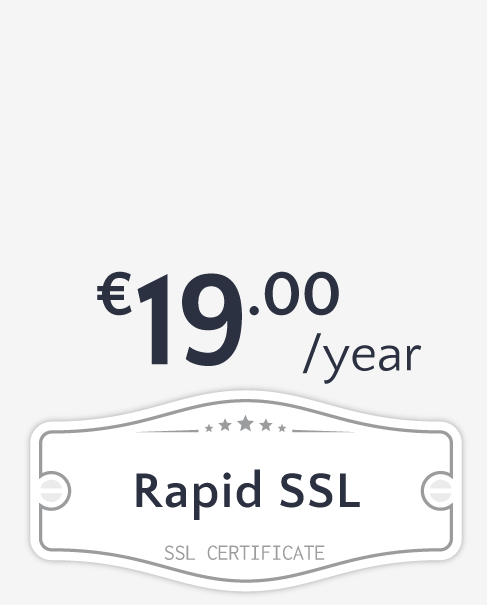 RapidSSL certificates all come with $10,000 warranty. You'll receive a free static Site Seal with your purchase, which you can place anywhere on your site to let customers know they're safe doing business with you. Featuring the strongest possible levels of encryption, dedicated customer support, unlimited server licenses, dynamic site seal and free PCI scanning for 1 year *, Instant SSL is not just great value for money, it is the complete trust solution for your website. By using Comodo SSL Certificate you guarantee the highest possible encryption levels for online transactions. Each certificate is signed with NIST recommended 2048 bit signatures and provides up to 256 bit encryption of customer data. Each TrustLogo features real-time 'point-to-verify' technology which displays your authenticated business credentials whenever a visitor places their mouse over the seal. As a valued SSL customer, you receive first class technical support for any issues or questions you may have during any part of the application, installation or life-cycle of your SSL Certificate. Buy with confidence! 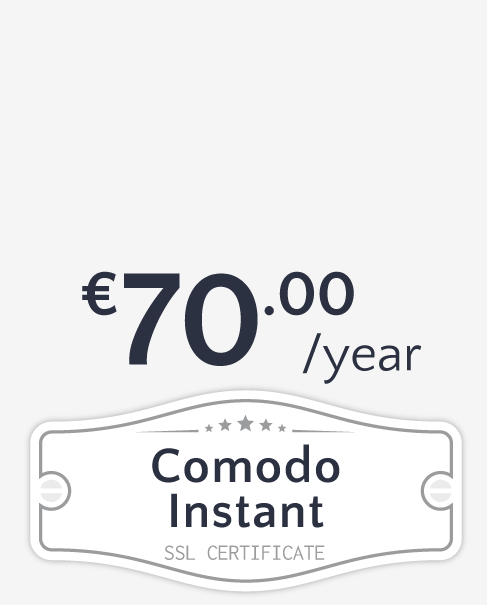 If you are not completely satisfied with any aspect of your purchase, Comodo will refund your money without any delay or hassles. Regular extended validation (EV) ecommerce certificates require a registered company name, a long-term operation history and lots of paperwork that may be simply excessive for a small ecommerce business. Those ecommerce folks who are not willing to invest too much too early will enjoy the benefits of a medium assurance GeoTrust QuickSSL Premium. While all certs give you security, their encryption levels or key lengths can be different. The larger the key, the harder it is to decrypt, although out of an endless number of combinations not even a genius with IQ 160 will be able to guess yours. GeoTrust QuickSSL Premium falls into the 40- to 256-bit range. Its precise encryption value depends on how old the operating system or web browser your visitors use is, along with the server configuration of your host. GeoTrust dynamic True Site Seal trustmark. 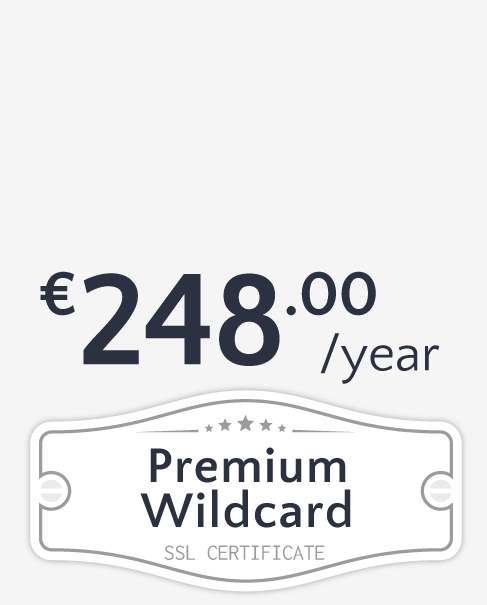 Wildcard certificates work the same way as a regular SSL Certificate, allowing you to secure the connection between your website and your customer's Internet browser – with one major advantage. A single Comodo Wildcard SSL Certificate covers any and all of the sub-domains of your main domain. Comodo Wildcard SSL Certificates have all the security features, compatibility and warranty of our single domain certificate and, unlike other providers, we do not double, triple, or spike the price of your Certificate for every additional license. Internet browser ubiquity is a key element when choosing an SSL provider. The more customer reach you have, the more effective your wildcard SSL certificate will be in building trust to your visitors. PremiumSSL Wildcard SSL Certificates have 99.9% browser trust, reaching virtually all of your potential buyers. 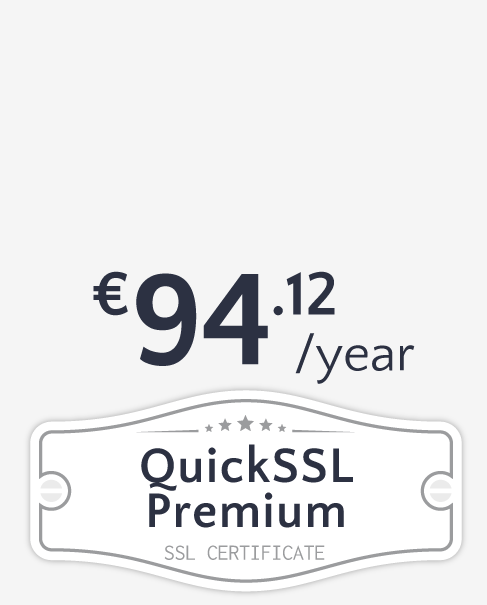 With ubiquity this high, Comodo's Premium Wildcard SSL is a competitive choice, comparing favorably to SSL vendors at twice the price. Extended Validation SSL achieves the highest level of consumer trust through the strictest authentication standards of any SSL certificate. Extended Validation verification guidelines require GeoTrust to obtain and verify multiple pieces of identifying information about Extended Validation Certificate Approver. Buying online is never easy for a customer. The reason? Feelings of insecurity — studies show that clients often abandon their shopping carts if a site seems unsafe, regardless of its actual security level. 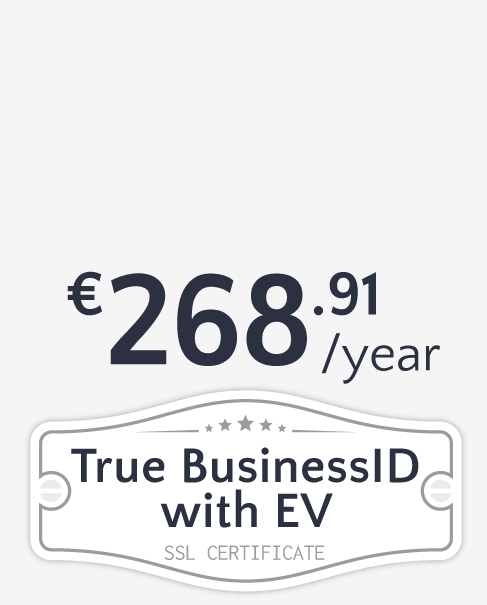 True BusinessID with EV solves this problem by displaying a green bar with your company name in a browser address bar. It doesn't matter what you use in CSR, both site.com and www.site.com will be secured. This rule doen't apply for subdomains though, as www.sub.domain.com in CSR secures only www version and sub.domain.com in CSR secures only the naked version. If you need both versions of subdomains, consider Comodo certificates. If sensitive info, such as credit card data, is stolen from a visitor because some bad guy broke your SSL, GeoTrust will pay big money to the victim of the fraud. Though, breaking a 128- to 256-bit cert is just unreal. 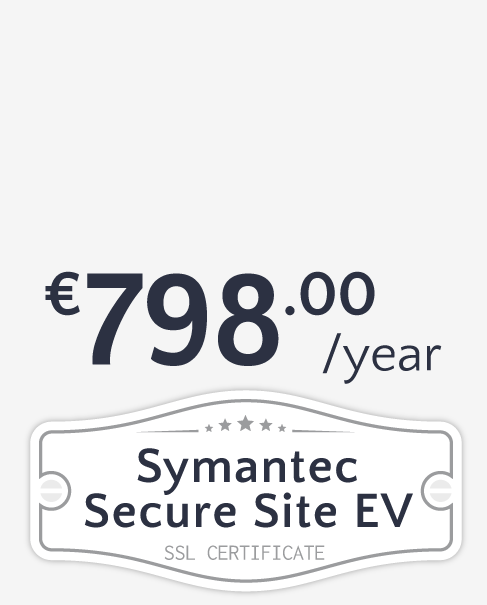 Symantec Secure Site with EV includes an SSL certificate, daily website malware scanning and vulnerability assessment to secure your site and help defend against attacks. The green address bar, Norton Secured Seal and Seal-in-Search technology assure your customers that your site is safe from search to browse to buy. Online shoppers recognize the green address bar as an easy and reliable way to verify the site identity and security. Only SSL certificates with EV trigger web browsers to display your organization’s name in a green address bar. Online shoppers are more likely to enter their credit card and/or other confidential financial information into a website with the SSL EV green bar. The Norton Secured Seal, the most trusted mark on the Internet, is viewed over half a billion times per day on websites in 170 countries. Symantec Seal-in-Search displays the Norton Secured Seal next to your link on browsers enabled with a free plug-in as well as on partner shopping sites and product review pages. 24/7 customer support and the Symantec Trust Center give you better visibility and control of your SSL certificates and services. With a single sign-in, you can renew, upgrade, buy, activate services or access a backup. Express Renewal and Automatic Renewal Service eliminates CSR requirements, installs and automates payment for up to 3 years. Better Search Engine Rankings for your website. Securing the connection between your website and your customer’s Internet browser. Securing information sent and received via mobile devices. 90% of those shoppers would have completed the purchase if the e-commerce retailer made visible evidence of SSL and a trusted Secured Seal. Symantec is one of the leading companies for the SSL market, and provide an incredible service at a reasonable price. It is one of the most popular SSL providers for a large proportion of online stores, and loved by major corporations and businesses. Founded as VeriSign in 1995, Symantec supports the world’s largest and most critical certificate deployments. The Symantec team use the same infrastructure as the DNS that supports .com on the Internet. GeoTrust is the world’s second largest digital certificate provider. More than 100,000 customers in over 150 countries trust GeoTrust to secure online transactions and conduct business over the Internet. The range of their digital certificate and trust products enable organizations of all sizes to maximize the security of their digital transactions cost-effectively. Founded in 1998, Comodo® Group, INC provides computer software and SSL certificate, as per W3Tech’s survey on various SSL brands, Comodo® has become the largest SSL Certificate Authority with 40.3% of SSL market share. The company also offers up to 256-bit encryption and is trusted by almost all browsers. They provide unlimited server licenses, expert phone support and a $250,000 warranty. A private SSL certificate requires its own dedicated IP address. When ordering an SSL certificate, a dedicated IP address will be added to your account automatically for free. A dedicated IP address is exclusively yours. You might choose to serve different sites from that IP address, but you’re ultimately in control of who’s using it. When switching to a dedicated IP, the IP address of your website will change, and the DNS will subsequently need to propagate (update) worldwide, which requires approximately 4 to 8 hours. Planning ahead - we don't recommend switching when you are in the middle of a promotion or advertising campaign. SSL Certificates are purchased with a 1-4 year expiration date. Before a certificate expires, you will need to purchase a new SSL certificate with a new expiration date. Despite sometimes being referred to as renewing an SSL certificate, technically you are purchasing a new certificate with a new expiration date.